Looks like one Derek Zoolander has been getting up to quite the shenanigans in the days leading up to the Feb. 11th release of Zoolander 2. First, he kicked things off with some top-modeling in Paris — in fact it was about as super-model-y as you can get; Ben Stiller had a walk-off with fellow model/actor Cara Delevingne, with the Eiffel Tower in lights in the background. Then, he jetted off to Italy, where he and Owen Wilson modeled Valentino at the fashion house's Rome flagship store. The Paris-based runway competition was fantastic on pretty much every level — from Stiller's sassy peace sign to Delevingne's on-point blue steel (not to mention a cameo appearance from her dog). The walk-off came as part of a larger social media stunt — a faux-relationship (complete with a jealous Penelope Cruz) between the model-turned-actor and actor-turned-model, in a fun little display of meta-marketing. 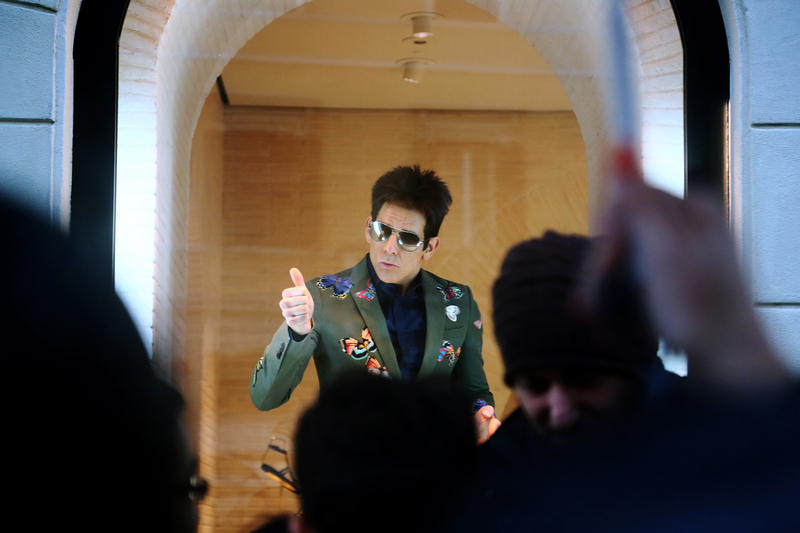 After strutting his stuff with Delevingne, Stiller headed off to Rome with Wilson, and the two rather fabulously modeled some stylish Valentino in the windows of the brand's flagship store. The two were in town for Zoolander 2's Rome premiere, and used their modeling gig as an opportunity to pose quite creatively (and blow kisses to one another). It's not their first Valentino rodeo (they walked in the brand's Paris Fashion Week show last year), and they took to the gig with all the aplomb you'd expect, with Stiller representing in the brand's popular camubutterfly print, and Wilson looking quite dapper in a chartreuse jacket, paired with a printed shirt and well-fitted khakis. Are you as excited as I am for Zoolander 2 yet?